Our Neon Open Signs let your customers know you’re OPEN for business. Neon Open Signs. Bright lights and fun fonts attract attention, which is just the thing you want to do. These affordable signs are lightweight, powerful and attention-getting. We have horizontal, vertical, cursive and Spanish Open Signs. Hang in storefront windows, doorways, entryways, adjacent properties and all commercial use. Great for any type of business. From a retail store or salon, auto, barber shop, restaurant or night club -- to a small office or specialty service. 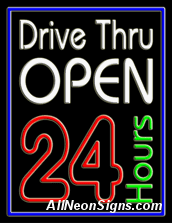 Entice them with an ice cream cone, pizza or multi-colored fluorescent sign. 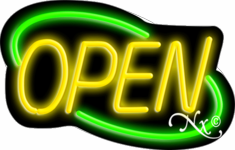 Increase traffic to your business and let those clients know when you’re OPEN! Better Quality Neon than big box stores. Click for Business Neon Open Signs or Custom Neon Signs.